The UND proposed mascot list is fascinating — and the beginning of an era. When I was a student at the University of North Dakota, the NCAA passed its resolution banning “hostile and abusive” school nicknames. When it happened, I, like many others, was outraged — not because of the name change, but because of the hypocrisy of the organization. Some schools were allowed to keep their logos, mascots and nicknames, while others were not. Florida State, who has a white guy dress up like a Seminole and run around on a horse with a flaming spear, could keep its name. North Dakota, which doesn’t have a costumed mascot, could not. On mascots, nicknames, and why something is better than nothing. I was talking to a former NHL executive Wednesday afternoon about mascots. We tossed around the question of where to draw the line between a mascot and a character. What separates the woman dressed up as Snow White at Disneyworld from the Leprechaun at Notre Dame? Are they mascots or characters? What about the Atlanta Braves’ Chief Noc-A-Homa? Somehow the Spanish word for “pets,” mascotas, entered the discussion, and that rekindled my gut feeling about what a mascot should be: Furry and non-human. But that’s just my opinion. A team doesn’t need a mascot, though they are always popular with the kids. I once covered a minor-league hockey team that had three mascots, turning each game into a Disneyland-type experience and proving that a team can have too many. In the NHL, the Stars, Oilers, Rangers and Flyers have zero mascots. That might be too few. At the bare minimum a team could use a nickname, which brings us to the curious case of the University of North Dakota. Officially, UND is just UND. No nickname. Its logo is an interlocking ND, similar to the more famous University of Notre Dame logo. In 2005 the NCAA decided the nickname in use at UND since 1930 — the Sioux (since the 1960s, the “Fighting Sioux”) — was “hostile and abusive.” In June 2012, state voters collectively banned the nickname, and the accompanying mascot and logo, at the polls. A few days later, the state’s Board of Higher Education officially banished the Sioux nickname to the history books. The university is prohibited from adopting a new team name until 2015. Reliving the greatest upset in college hockey history. The world of sports is full of great upsets and hockey boasts some of the best. I mean, did anyone expect the Los Angeles Kings, of all teams, to suddenly become unstoppable and win the Stanley Cup two months after barely making the playoffs? College hockey has had its share as well. Just about every year, a small school upsets a traditional powerhouse and provides a great story for sportswriters and fans to behold. In some cases – Bemidji State in 2009 and RIT in 2010 – the teams pull off two upsets and make it to the Frozen Four. Ask most college hockey fans to name the biggest upset ever, there’s really only one: Holy Cross’s win over Minnesota in the 2006 West Regional in Grand Forks, N.D. 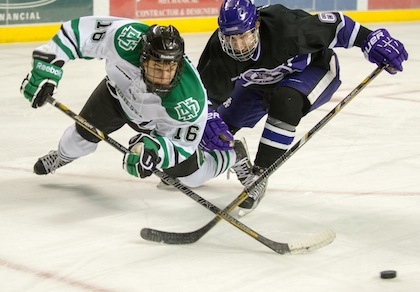 This past weekend, Holy Cross returned to Grand Forks for the first time since 2006 so I figured now would be the perfect time to look back at their big win. (After all, they almost pulled it off again Saturday before North Dakota woke up in the third period).